Spc. Astor Sunsin-Pineda, 20, died Wednesday when his vehicle was struck by shrapnel from an improvised explosive device in Baghdad, the U.S. Department of Defense said Friday. Obituary: Army Spc. Astor Sunsin-Pineda known as a positive, inspiring young man. LONG BEACH - During his time at Wilson High School, Astor Sunsin-Pineda was known as a positive student who took the time to cheer up friends when they were feeling blue. So his stepfather Julio De Paz was not surprised to hear that Sunsin-Pineda, a U.S. Army combat engineer, did the same for his fellow soldiers in Iraq. "He was always motivating the other guys," De Paz said, reporting what Sunsin-Pineda's fellow servicemen told him. "When everyone was down, Astor would get up and motivate his compadres in the Army." Spc. Sunsin-Pineda, 20, died Wednesday when his vehicle was struck by shrapnel from an improvised explosive device in Baghdad, the U.S. Department of Defense said Friday. He was assigned to Special Troops Battalion, 4th Infantry Brigade Combat Team, 1st Infantry Division. entered the Army in August 2005 and began serving with the 1st Infantry Division in January 2006. While stationed at Fort Riley in Kansas and in Iraq, Sunsin-Pineda was content and motivated, knowing that military work was what he always had wanted to do, De Paz said. "He was very driven," De Paz said. "He was smiling all the time. He was very positive. Everything he tried to do, he accomplished." During high school, Sunsin-Pineda often worked in De Paz's automotive service shop in Long Beach, and he also enjoyed playing soccer and snowboarding. He finished his senior year at Wilson, but took classes in adult school afterward to fulfill his diploma requirements, his stepfather said. "He loved school," De Paz added. 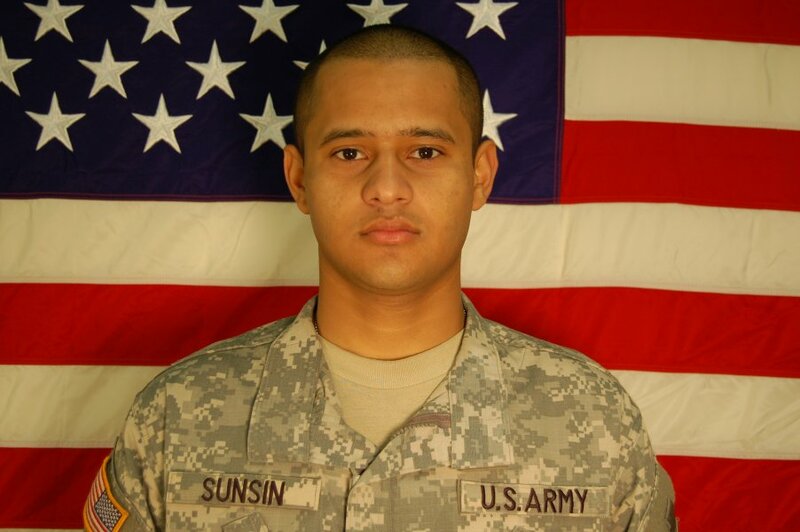 While in Iraq, Sunsin-Pineda was in frequent contact with his family. He told family members, "Don't worry, I'm doing what I want to do," De Paz said. Following his tour in Iraq, Sunsin-Pineda planned either to continue a career in the Army after his service in Iraq or become a police officer, De Paz said. Sunsin-Pineda regularly read the Bible and, in the wake of his death, family members have been taking comfort in their shared religious beliefs. "We preach the word of God, and we know that he just went ahead of us, and we will be together," De Paz said. Sunsin-Pineda Kevin Butler can be reached at kevin.butler@presstelegram.com or (562) 499-1308.